It unites and identifies us as a people – our country’s flag. We wear it with pride in our lapel pins and jewellery, stickers on our luggage, on our t-shirs, our school bags, our boats, cars and campers, and sometimes painted on our faces. To me it epitomizes the fierce love and loyalty I have to my beautiful and unique country, Canada, where I was born, my father and mother before me, my daughter. Red, white and blue in combination are very strong colours, and many countries have chosen strictly red, white and blue for their flags, as you can see from the above picture. The three colours complement each other, blending beautifully. The Stars and Stripes, and the Union Jack are particularly beautiful in my eyes, especially when I can’t help but be reminded of the history of both of them. 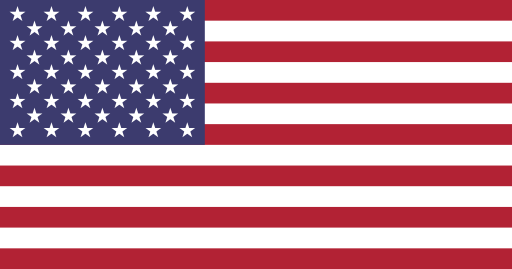 Old Glory showing it’s proud independence wrested from Great Britain at a blood cost in history, declaring to the world as a republic comprised of 50 states, each independently proud of its statehood as well. The Union Jack’s incorporates England’s and Wales’ red cross on a white ground (St. George), Scotland’s diagonal white cross on a blue ground (St. Andrew) and Ireland’s diagonal red cross on a white ground (St. Patrick). 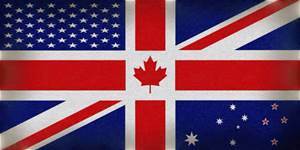 As a child, the Union Jack (and the Canadian Red Ensign) were the flags of our country, Canada, and the Stars and Stripes reminded me that both countries came from the same backgrounds. …and The Union Jack of Britain. 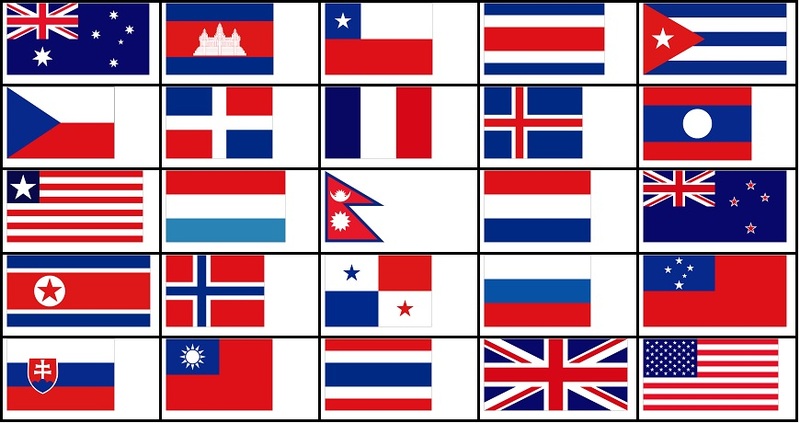 Some others countries’ flags are basically red, white and blue, but also have symbols with other colours in them, so I have not shown them here. Did you know that Canada was supposed to have a red-white-and-blue flag too? Canada had previously used both the Union Jack and the Canadian Red Ensign to represent our country, and the Red Ensign had come to be the recognized flag of the Dominion since the 1890’s. Public opinion wanted the Union Jack flying over parliament, which it did, until the Red Ensign in the 1920’s. In 1945, the Canadian Red Ensign became the official Canadian Flag by Order in Council. But Canada kept fretting about having a truly unique flag which symbolized Canada, and in 1946 a Special Joint Committee recommended a flag with a Union Jack in the upper left, with a golden maple leaf at the right, on a red background. Still fretting about it, an extensive poll was taken of the preferences of adult Canadians, resulting in 80% wanting a national flag entirely different from that of any other nation, and 60% wanting that flag to bear the symbol of the maple leaf. Many Canadians, including the Royal Canadian Legion and the Canadian Corps Association wanted to make sure the new flag would incorporate the Union Jack as a sign of Canadian ties to the United Kingdom, and to other Commonwealth countries such as Australia and New Zealand, which use the Union Jack in the quarter of their national flag. But Quebec province and the Liberal Party did not want the Union Jack in our new flag. The preferred choice for the new flag, and supposedly supported by Prime Minister Pearson, was a simple three maple leaves on white, with two blue bars on either side, reflecting Canada’s motto “From Sea to Sea”. 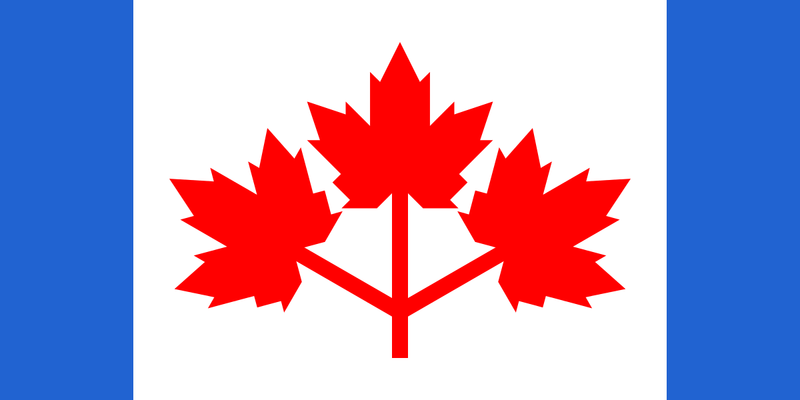 Most Canadians loved that flag design, or another version of it displaying one red maple leaf in the centre. 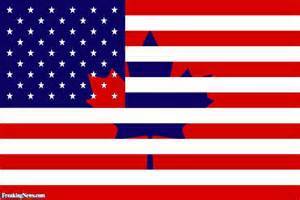 I preferred the one leaf flag myself, shown below, and that was the flag that was at the top of the list that Canada wanted as their flag. A resolution in parliament was: “…. 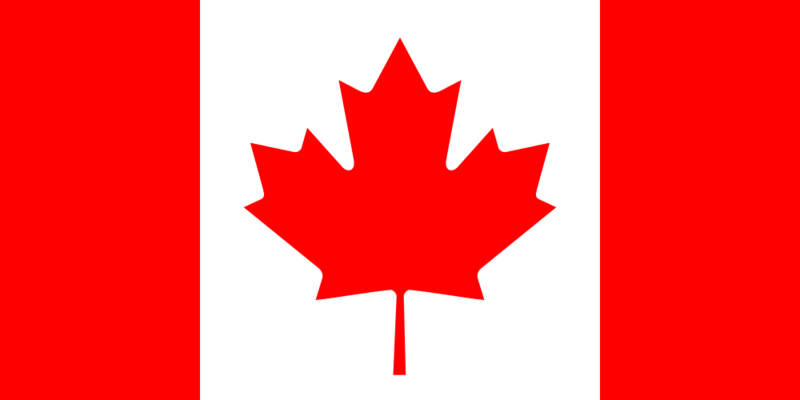 to establish officially as the flag of Canada a flag embodying the emblem proclaimed by His Majesty King George V on November 21, 1921 – three maple leaves conjoined on one stem – in the colours red and white then designated for Canada, the red leaves occupying a field of white between vertical sections of blue on the edges of the flag.” The blue edges embodied our national motto of “sea to sea”. Of the thousands of design preferences submitted by the public, 2,126 contained maple leaves, 408 the Union Jack, 389 the beaver and 359 the Fleur-de-lys. I remember we received in the mail a depiction of the final flag shown above, chosen as the most popular new Canadian flag-to-be. Most people were happy with the choice – and the only decision left being considered was whether there should be a trio of leaves or one leaf, but at the last minute, the new flag choice was snatched away from us. A last-minute flag design was slipped into the mix by historian (and Liberal) George Stanley – not part of the contest, by the way – with a single red maple leaf centred between two red bars on a white background. Remember – the Pearson Pennant with the blue bars was the Canadian people’s choice – and we were told this would be the winner. Except, when the smoke had cleared, the Flag Committee chose George Stanley’s design of red and red and red on white. It was a win-lose decision for Canadians. We had won a unique and distinctive flag, instantly recognizable and known around the world, but lost the one that was our choice, with the distinctive representation of our motto for blue “Sea To Sea”. (Canadians had to settle for “Red Sea to Red Sea”, I guess.) We were told in articles written at that time that it was primarily because the Liberals wanted no “Tory blue” to be incorporated into the flag, but plenty of “Liberal red.” If so, I find it repugnant politics. But with government, it is ever so, isn’t it. Not power of the people, but Power Over The People. 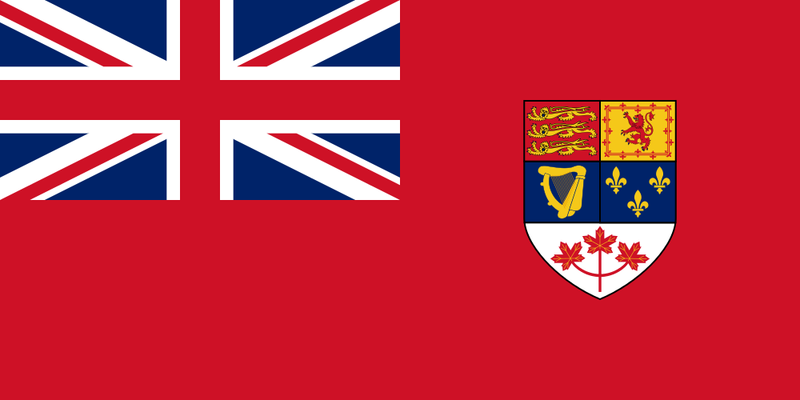 The Canadian Red Ensign can sometimes be seen today, often in connection to veterans’ associations. The provinces of Manitoba and Ontario adopted their own versions of the Red Ensign as their respective provincial flags in the wake of the national flag debate. On the other hand, Newfoundland used the Union Jack as its provincial flag from 1952 until 1980, the blue triangles adopted in 1980 being a tribute to the Union Jack. British Columbia’s flag, featuring the Union Jack in its top portion, was introduced in 1960 and is actually based on the shield of the provincial coat of arms, dating back to 1906. Wonder what the flag would have looked like if our closest neighbours, and long-time friends south of the border had some input in the flag decision. Perhaps something like this? 9/11 – ALWAYS REMEMBER…. NEVER FORGET! I was so moved by my daughter’s recent heartfelt Facebook post of her remembrance of 9/11 that I asked her if she would share it on the blog. I don’t think we should just set aside one day a year to keep our feelings alive — we don’t ever want this to happen again. We need to stay alert and aware and watchful as we remember. I remember where I was and what I was doing on September 11th, 2001, but before I tell my story I want to remind you of a few cold, brutally hard facts. There were 2,977 people killed in the September 11, 2001 terror attacks at the World Trade Center in New York City, The Pentagon in Virginia and a lonely field in Shanksville, Pennsylvania. This figure includes those on the airplanes that were used as bombs and some who died later from diseases and complications caused by injuries and toxins at Ground Zero, but does not include the 19 suicide terrorists. Their lives count less than nothing to me. Many hundreds more are currently gravely ill as a direct consequence of being near Ground Zero of the attacks. Of those who were killed on that date 343 were firefighters, 72 were in law enforcement and 55 were military personnel. Most of them died trying to save others. The rest of the victims were civilians from over 90 countries, including 24 from my home country, Canada. I was catching up on the TV news before leaving for work that morning when the first plane slammed into World Trade Center, North Tower. I remember hearing the newscasters speculating what kind and size of plane it was and what kind of mechanical or navigational problem could have caused it to crash. I set my recorder to tape the news channel so that I could find out what had happened when I got home. What I knew at that point was horrible enough, but when I got to work my first telephone call was from my Mom telling me a second plane had just hit the World Trade Center, South Tower. We both knew this was no longer some sort of accident or malfunction. This was a terror attack. It became impossible for me to work as I listened to radio reports of another deliberate plane crash, this time aimed at the Pentagon. There was also a gigantic television monitor on the outside of an office tower next to my workplace which had switched from local news coverage to the ongoing terror attacks. I saw shocked New Yorkers standing in the streets staring in disbelief, gasping, crying, trying to somehow comprehend what they were seeing. Others, closer to the towers were being urged by police, in no uncertain terms, to run for their lives, and run they did. I watched in horror as the towers burned and belched black smoke and people on the upper floors of the buildings frantically waved clothing from windows they had smashed open, hoping somehow to be rescued. I saw those who decided jumping was a better death than the intense fire that surrounded them. My heart was breaking for them all. I watched as the south tower tilted and came crashing down, floor by floor, followed shortly after by the north tower, pancaking in on itself. Those people still left alive on the ground were running, screaming, in fear for their lives as huge billows of smoke and dust engulfed everything – the world went black as night and horribly silent. As the debris cloud slowly drifted up I watched dazed survivors, covered in soot and ash and burns, slowly struggling through a desolate landscape littered with thousands of pieces of paper from the downed towers and smashed fire engines and emergency vehicles. The streets were unrecognizable with debris and destruction. I wept for the firefighters I had watched rushing in to save others and the police who were protecting and clearing the area around the towers. I knew they must have perished along with those still trying to escape the buildings. Then we heard of a fourth hijacked plane crashing in a field in Pennsylvania and I worried that the next target could be Washington. What new horror would I hear of next? I felt like I was watching the end of the world. I have no idea how my coworkers and I made it through that horrible day. Parts of what happened are still crystal clear to me and other moments are lost in a fog of sorrow. My Mom and Husband kept in touch with me all day, which was my lifeline. I recall thinking “I’m grateful my Dad didn’t have to see this horror in his lifetime”. I think the bank closed early due to fears for our staff’s safety, because we were in the downtown financial and business hub of Toronto. Oddly, I can’t remember that detail clearly. I do remember being grateful to get home to my Husband and I do remember tears that wouldn’t stop. As the evening wore on we watched the relentless efforts of the emergency personnel doing everything in their power to look for survivors. It was a monumental task as Ground Zero was still burning uncontrollably. I remember watching gigantic hoses shooting water over the flames late into the night. The debris and twisted metal and smouldering ruins piled many stories high made it an unbelievably dangerous place to be. I saw doctors and medical staff standing ready with life saving equipment and empty stretchers. They had already helped those injured during the day and were hoping, along with the rest of us, that survivors might still be found. I remember praying for all those souls that had their beautiful lives stolen from them. All they did was wake up and go to work, just like I had, but they didn’t get to go home to their loved ones. Their friends and family would never get to talk to them or look at their faces or hug them ever again. On that day, and whenever I’ve thought about that day since, I still feel like I lost members of my own family. How much more horrible must it be for the victims left grieving their true losses? It’s unimaginable. Gut-wrenching anger would overwhelm me soon, but on that day a soul-deep sorrow was as much as I could bear. Finally I remember watching President Bush speak to the nation from the Oval Office. I knew the resolution I heard in his voice was the resolution of the entire nation that, no matter how long it took, justice and retribution would prevail. I fear too many have forgotten how they felt that day and in the terrible weeks and months after. It almost seems like some feel it’s bad etiquette to bring it up or dwell on it. It’s fading in their memories like a disturbing movie they saw and would rather forget. I also fear that those too young or not yet born, will not be taught what really happened when they are old enough to understand. Parents must remember that knowledge is power. Our children will need to feel what we felt and learn what we learned to stay safe. 9/11 cannot become just another date marked on the calendar or be reduced to a monument you might visit on vacation. If we downplay it or try to ignore the facts of what happened, and more importantly, what many people in this world desperately want, and are constantly attempting to see happen to us again, we do so at our peril. It wasn’t a horror movie. It happened. I witnessed it. 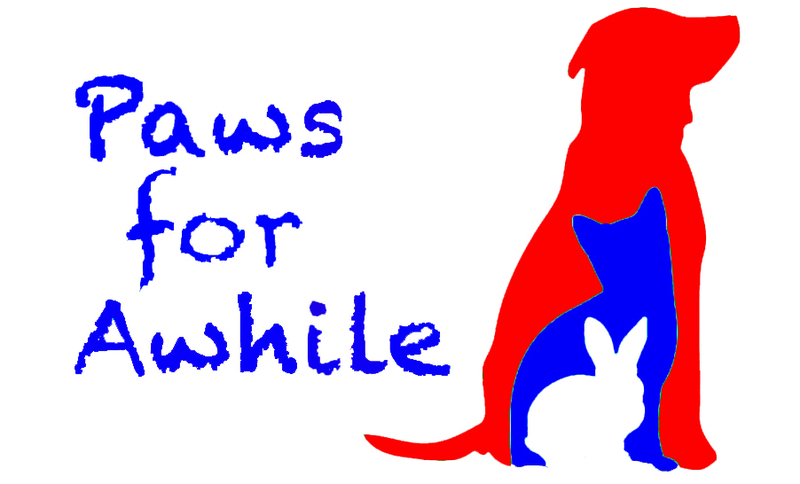 I’ve chosen a few songs for Mom’s blog that relate to both the “Red, White and Blue” theme and to our determination to never forget what happened on 9/11. 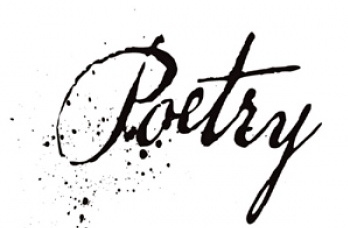 These poems are dedicated to those wives who lost their husbands on 9/11. Although I didn’t have my husband snatched out of my life in such a brutal, cruel, senseless way as they did, I feel his loss from my life every day. Perhaps this will touch a chord in their hearts, knowing that someone empathizes with them, and somewhat understands their pain. still searching for your face.